10 Minute Mail is one of the known names to create a temporary mail address. It provides a random email address that remains up for 10 minutes so in case if you need fake emails or temp email, then it is best. These websites are fake email generator. But if you need the email that lasts more than 10 minutes or need more functionality, then you have to look at some alternative random email generator. 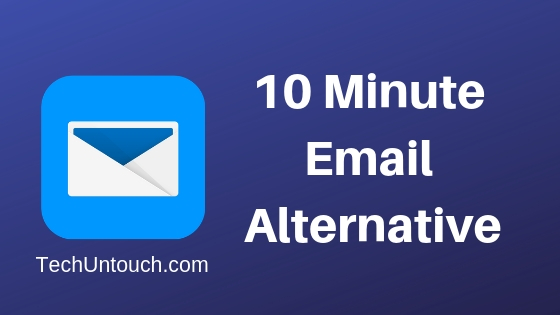 So here we are with the best alternatives to 10 minute mail. 1.1 Why One Need To Use A Temporary Email Address? 1.2 What To Look At A Temporary Email Address? Sometimes it is possible that you need little more functionality like access to the emails more than 10 minutes or need a memorable email address so that you can give it to people. In such a case, we need some alternative email address generator. Even we do not want spam mail in our inbox, and thanks to improvement in security consciousness that provide us some alternate ways to save our inbox and some secure communication options. So for many of the people think that why one need temporary email address then do not worry we have an answer for that too. We look at this answer first and then we will move to the alternative of 10-minute mail. Why One Need To Use A Temporary Email Address? When a website needs your login information, and even after some transaction some website needs the confirmation of your email. When you use your real email id, you will find that it will be filled with many unnecessary emails. So to avoid such situations, the temporary email address is ideal. It ensures your privacy and provides you more convenience. Temporary email addresses will redirect all marketing emails and spam whenever you sign in to some offers or looking for the quote online. Using Fake email generator is the best way to avoid all these stuff. A temporary email address will delete all emails that you received in your inbox when the address expires. So there are no worries that people can access to your emails. What To Look At A Temporary Email Address? When you are looking for fake email generator as an option of 10-minute mail, then you need to look at some features that are given below. Many fake email address generators website are no more up or under a working condition so make sure that they are properly working before you use them for your important work. Most of the sites give you two option one is to create the email by the site, and another one is to create by the users. To save time it is best that it will generate by itself instead of the user. Some options let other users access the email of others. So make sure that the option you pick does not give access to another user because it is possible that you will send some sensitive email to someone and it will open by others, and they will get all the information about you. Fake Mail Generator, the name suggest all. It is a classic temporary email address generator that can create a random email with multiple domain names. It is possible that you do not like the automatically generated email id, then you can pick from the options. Other than this site do not provide anything else. For years Mailinator is in the market. It is very reliable and one of the best temporary email address provider. As the website is easy in terms of interior, one can set up a new email address within minutes or less than this. They suggest a few email address, and you have to pick the one that you find suitable for you. Mailinator is free if you want to use a single email address for own. For multiple inboxes and unique email addresses you have to pick paid option. It will show you email testing options, email storage, or enterprise level volumes of email addresses. MailDrop is similar to the Mailinator, and it gives you your new mail in few seconds only. It gives you complete freedom to decide your email address. However, you can pick from the suggested address, too. For all email, it uses the @maildrop.cc domain, and it is accepted by most of the online web forms. MailDrop is open source and completely free. Guerrilla Mail has an ancient website that is from 1990, but the email section works well. In this list, I think it is the oldest fake email provider. With it, you can get an email ending from the @sharklasers.com! The fake email inbox remains long last till the session remain open. In case if you don’t want to use the sharklasers domain name for any reason, it will also provide you some domain suggestions as well with different addresses. Getairmail is another alternative and super-simple site to generate random email addresses. Click on the Get Temporary Email and get your email address within no time. You can change the email address or domain names like @asfghtg.com. The site is easy to use and fast. The first of the mail is changing as it is generated with random letters. But you can change it if you do not like it. Aside from it, you will get your email address immediately. When you open dispostable for the first time, you might find that it will not do the work, but as people said never judge the book by its cover, the same is true for dispostable too. It gets done the job and creates the email with the end name @dispostable.com. It does not give you multiple suggestions. The generated emails last for three days. What you have to do is to enter the address and click on check inbox to read all the emails. TempMail is another option for you if you want to get the temp email address to save your inbox from spam. This site generates fake emails automatically, and an inbox is associated with the address. From the left menu user can copy the email address for use, change the address, refresh the inbox or delete the email address. However changing the email address is easy but whenever you click on change, it will ask for login. It is the first part of your temp email address. Here you can add anything, and in the second part, you have to pick the domain name and click on the save. On the top, the email address will reflect. Compared to the rest of the name in our list, Bouncer is a little different. Here you have to sign in with your real email address, and it will send you the link of your fake email address. So from the original inbox, you can check, edit or delete the new temporary email address of Bouncer. So all these are the best alternatives to 10 Minute Mail. Any website or forms do not block all these services so you can easily create the mail and use it. Next time when you visit any anonymous site, think twice before you give your actual data. Thank you!